“The neighbors that I met through this process were great, and I loved giving away the produce, but we were like, ‘well, this chair is kinda janky. It’s sitting on our front porch and you have to walk up all the way and see if there’s anything,’” Lee said. 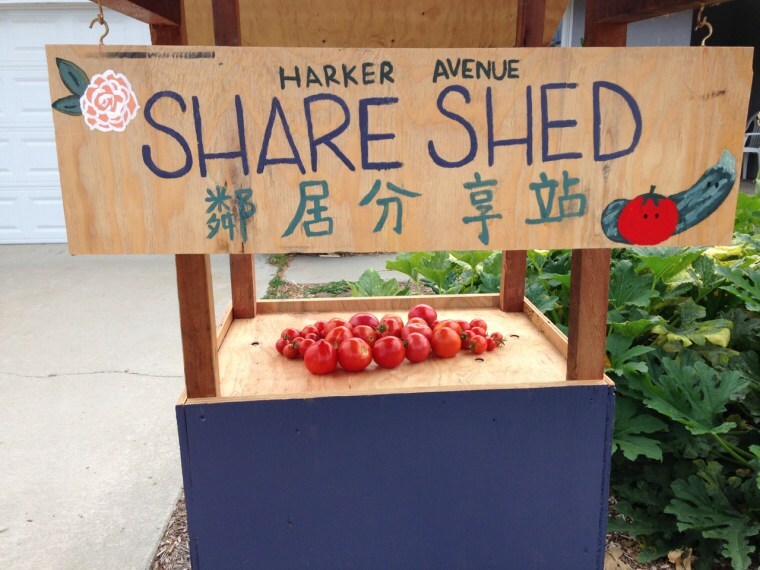 Lee — who detailed the shed’s creation on Frugal Happy, a blog dedicated to living a low-impact lifestyle — believes community-focused projects like the Share Shed and the “Little Free Library” can be beneficial to neighborhoods. The shed also has instructions printed on the side in both English and Chinese. They read, “Everything here is free! Take what you love; Donate what you don't need." “If kids have early exposure to growing produce, they are more likely to have a healthier relationship with the produce,” Wang said. It’s that community building aspect that holds much appeal for Lee. Prior to moving back to her childhood home in Temple City after the passing of her mother, Lee was part of a close-knit community in Oakland, California, and for many years biked and took public transit. The lack of interaction brought back memories of when she was a child growing up in a “protective and cautious” household where she was told to stay inside. “I do remember growing up, we never talked to our neighbors, and I do remember when the doorbell would ring, our mom would tell us to hide and pretend we weren’t home,” Lee said, adding that she hopes to create more of an open dialogue for neighbors to engage in their communities. Since its debut, the Share Shed has continued to receive positive feedback, Lee said. Some treat it as a “drive through” produce stand and young children often peek into the shed to see if there are any new offerings for the day. “I could tell that it was something a little new to them. I think we sparked a lot of curiosity among neighbors,” she said.